Facial Palsy, idiopathic facial paralysis, or Bell’s Palsy is a face condition as a result of inflammation of the facial nerve causing paralysis of the facial muscles on one or both sides of the face. What is the cause of Facial Palsy? 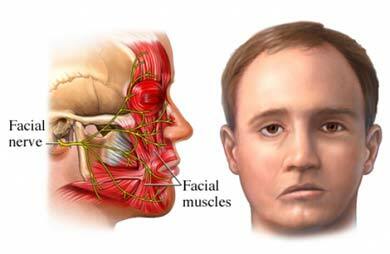 Facial palsy thought that the nerve controlling the muscles of face (VII cranial nerve) becomes inflamed in its bony canal which affects the transmission of nerve impulses. Facial weakness can occur in other conditions such as stroke, brain tumours or head trauma. The condition in many cases resolves quickly with physiotherapy, especially for those with partial paralysis. Research has shown that physiotherapy can improve the impairments associated with Bell’s palsy. At heal360 Physioclinic, our therapists can help to improve facial muscles symmetry, sense of well being, confidence, eyes closure and improved facial movements. Following a assessment of your condition, your therapist will advise you through the most appropriate individual treatment plans and goals for your Facial Palsy.